Good things come to those who wait. 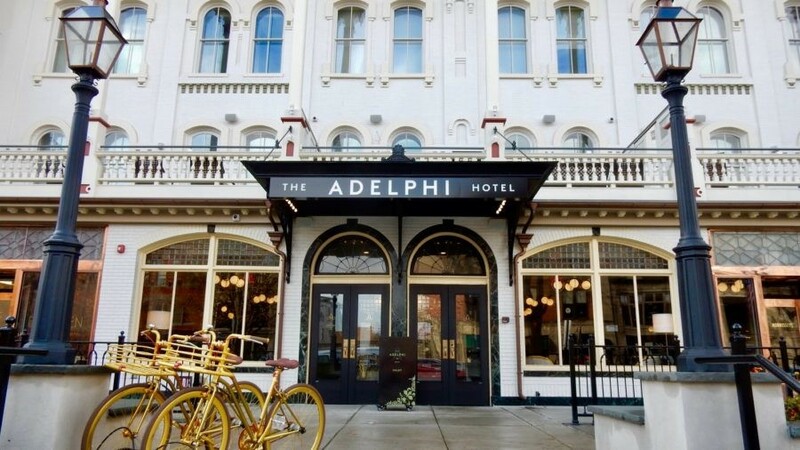 The much-anticipated Adelphi Hotel, meticulously reborn after nearly 5 years, is a brighter, lighter, more splendiferous version of it’s former Victorian self; from lobby to classy, luxurious guestrooms. 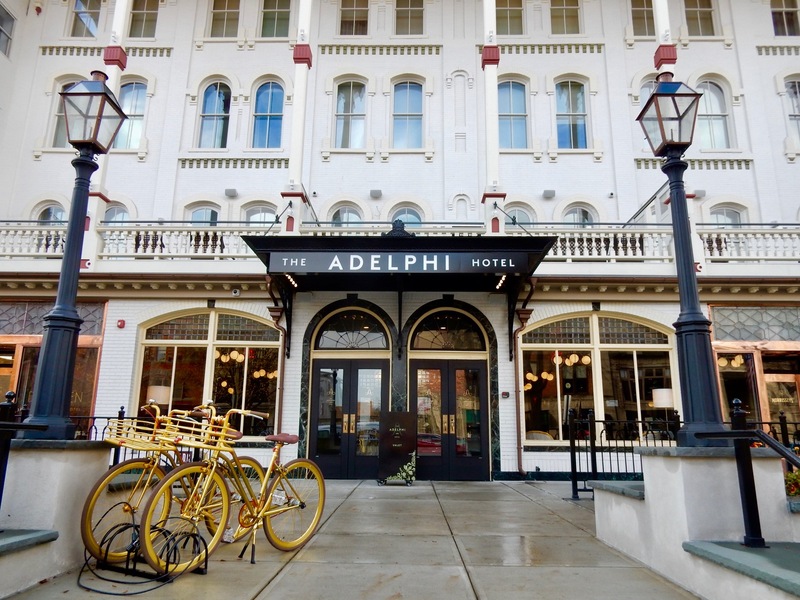 First built in 1877 as a 100-room hotel, the Adelphi was a town landmark in the early days of thoroughbred racing, when the Saratoga Racetrack drew thousands of well-heeled visitors to town. 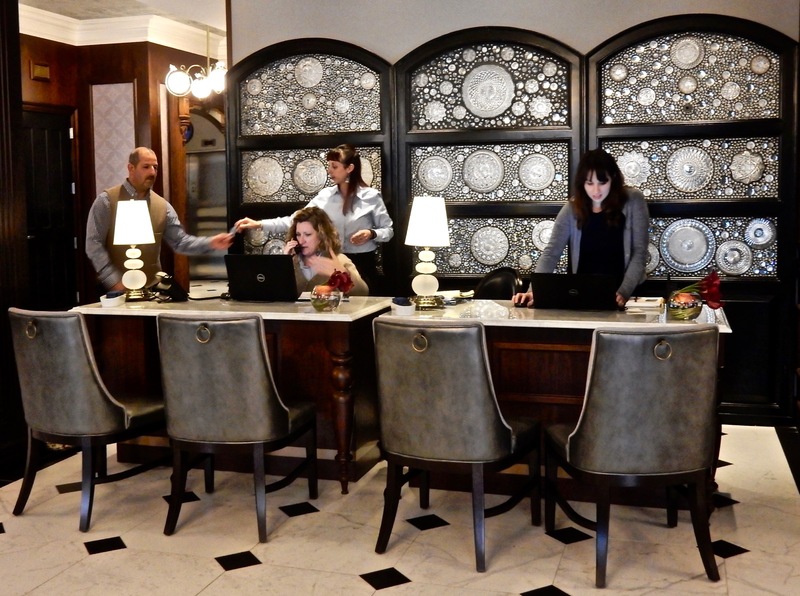 By the early 2000’s the Adelphi, with its dark, heavily draped Victorian-style lobby, required a complete makeover. Closing in 2012, it reopened in early October 2017 after a head to toe renovation. What took so long? Once gutted, there were structural issues that needed to be – and were – addressed: brilliantly, as it turns out. The foundation was buttressed, the facade’s columns were reinforced (with steel rods), hotel rooms were enlarged to include en suit bathrooms, and the lobby was expanded. Now a 32-room hotel, the Adelphi has managed to recapture its original intent: to impress the jaded, to indulge luxury guests, and, most effectively, to please the eye. Etched crystal plates from the Adelphi’s prior life form a striking montage behind the reception desk, where friendly, accommodating staff welcomes guests warmly and personally. Original furnishings in the lobby have been re-upholstered in trendy metallic leather, bold colors, and silver trim. 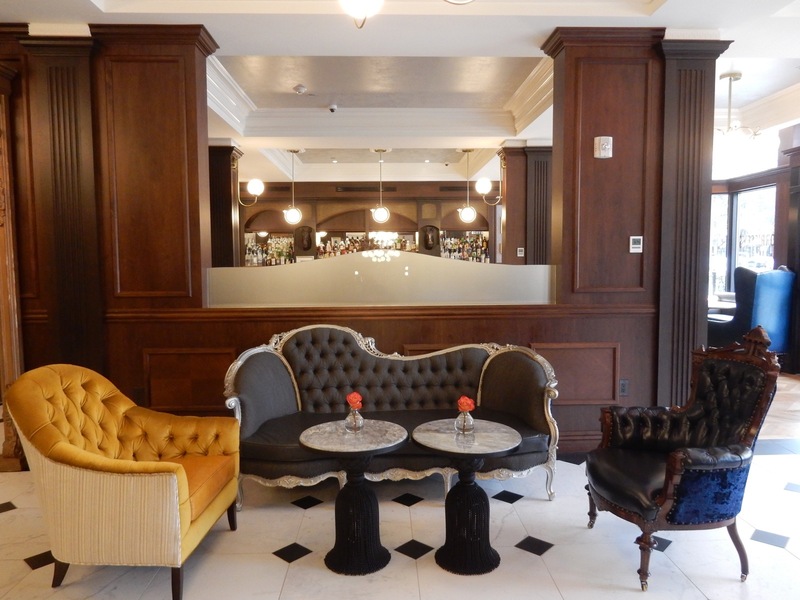 The lobby space flows into Morrissey’s Bar – named for the colorful Irish-born NY Senator, and founder of the Saratoga Race Track, John Morrissey, who died in the Adelphi Hotel in 1878. 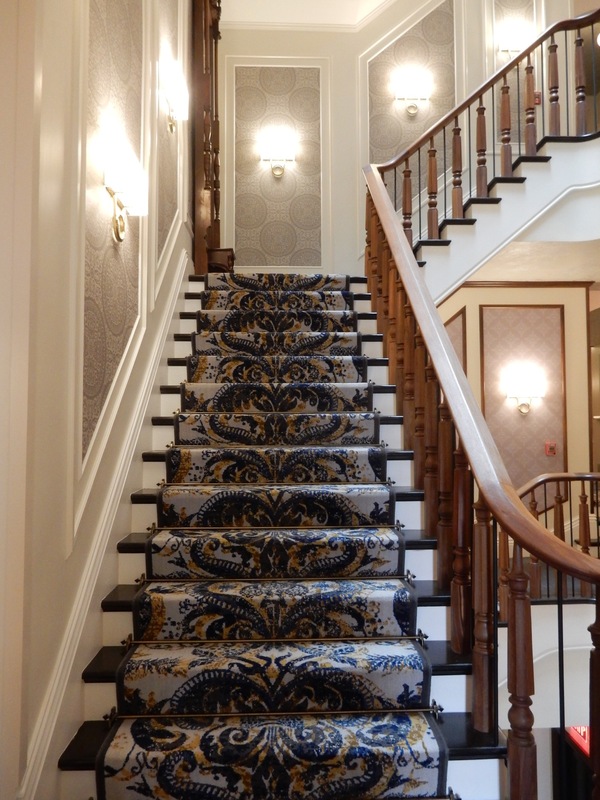 In addition to the reupholstered lobby furniture, the wood banisters up steep stairways, and common area mirrors are original to the building. The Library on the second floor is open for all guests unless both suites that bookend it are rented by one group. In that case, those guests can close it off and use it, as well as the long balcony overlooking Broadway, as a private gathering space. 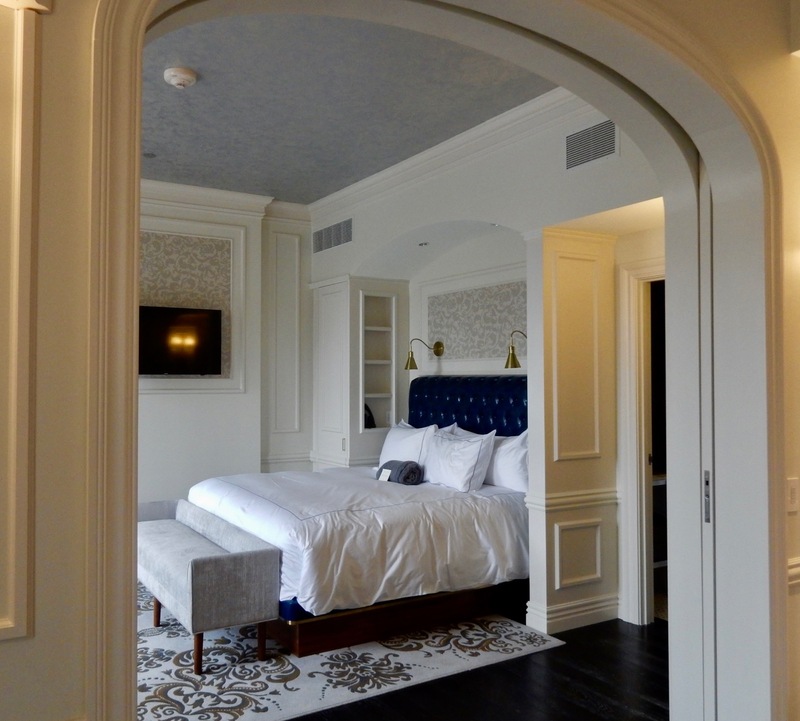 Thanks to NYC-based interior designer, Glen Coben & Co., attention to detail in each room is beyond stunning, down to the silver-tone sponge-painted ceilings (a softer look than pressed tin). Open the door to the motorized buzz of blackout shades rising and drapes swishing to the side automatically – sending natural light into your chamber dressed in grey, navy, silver, and gold hues. 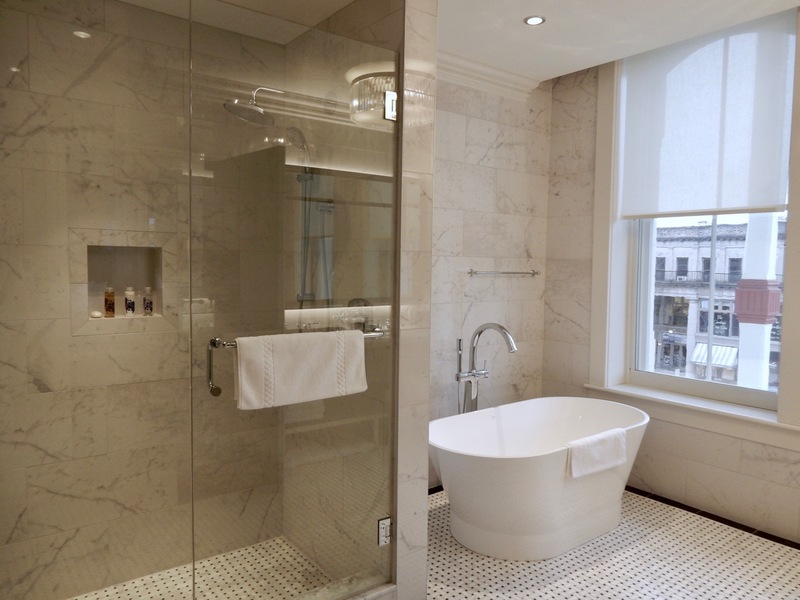 Design-forward-bathroom buffs will adore either room 303 or 403. Both feature a salle de bain the size of a NYC studio apartment, with Carrera marble walls and sink, gleaming basket-weave mosaic floor, soaking tub, glass rain-head shower stocked with nearly full-size bottles of Red Flower shampoo, conditioner, shower gel and, in a separate room, a futuristic toilet with warmed seat and bidet controls. 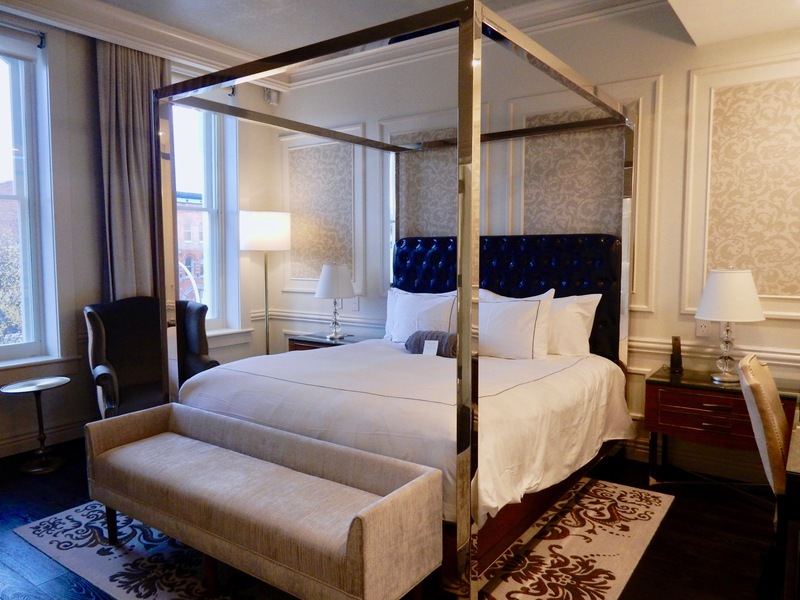 I often measure a hotel’s level of luxury by its turndown service, and again, the Adelphi delivers. 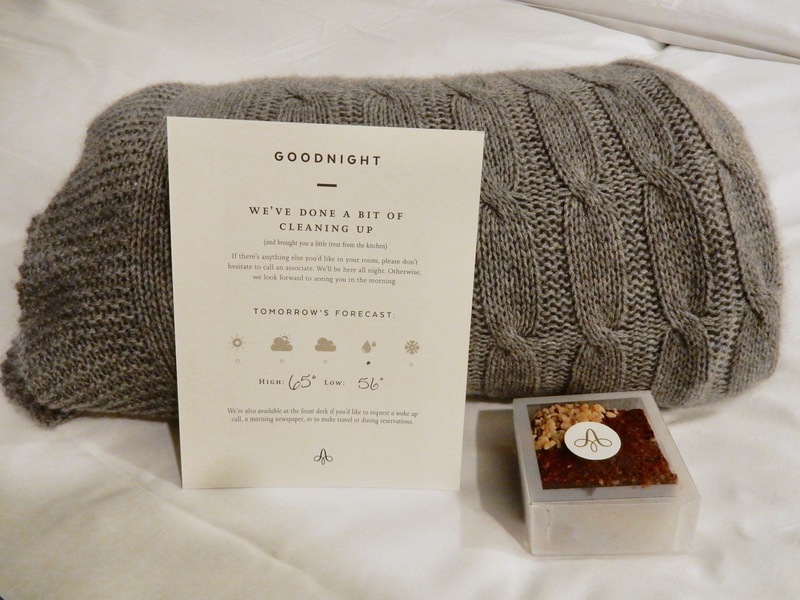 There’s the cursory tidying up and prepping the bed for sleep, of course, but rather than a nip of chocolate on your pillow, you’ll find a nice treat from the kitchen (two brownies or a box of artisanal confections), with a card indicating the next day’s weather forecast. 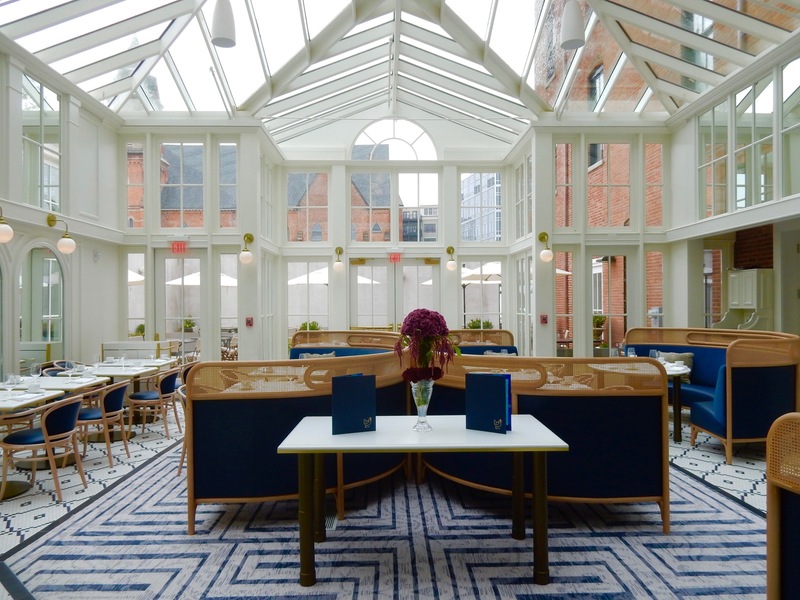 Blue Hen: in a soaring sun-flooded conservatory, dining in the Blue Hen would be a pleasant experience, no matter the quality of the food. But the dishes, made mostly from locally sourced ingredients, are actually quite good. 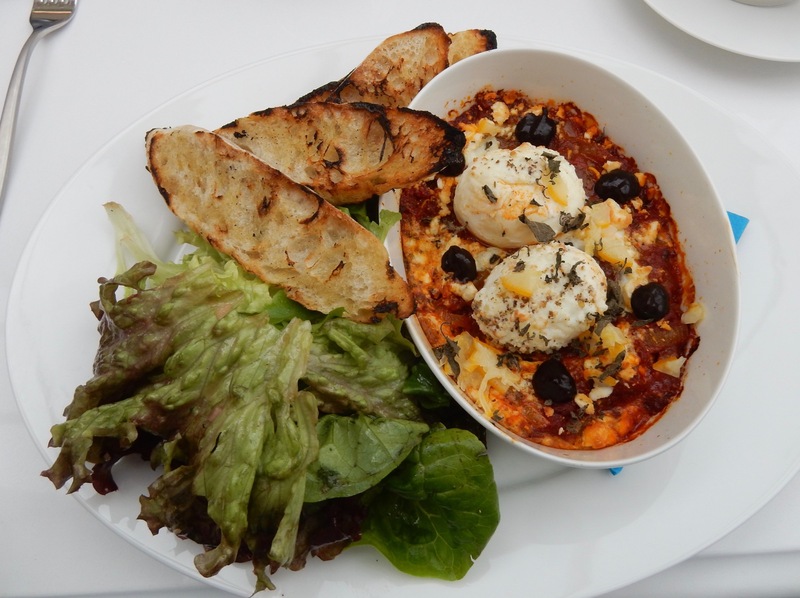 For now only breakfast is served – but if evening fare rises to the level of my marvelous morning Shakshuka, guests will be in for a treat. Stay tuned. Morrisey’s Lounge, just off the lobby is not only a bar par excellence, but a “Small Bites” restaurant as well. You can dine casually on Pizza, Flatbreads, Salads and other sharable vittles while sipping your favorite beverage. Salt & Char: Under the Adelphi umbrella, you must exit the hotel in order to get to this low-lit steakhouse that is winning raves in town. This is a historic renovation with expansion still in progress. The older iteration of the Adelphi was known for its charming backyard formal gardens, and plans are in the works to replant those, and add a fountain, by Spring ’18. Over the next few years, Phase 2 of the new Adelphi will add 50 more rooms with fitness center, indoor pool and spa. 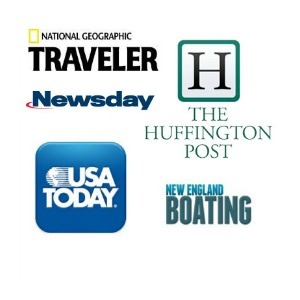 Rooms and suites from $285-$1,000 depending on season and day of week, include wi-fi and parking.